SecuROM 7 DRM. Multiplayer requires Steam. All versions require Steam DRM for multiplayer. 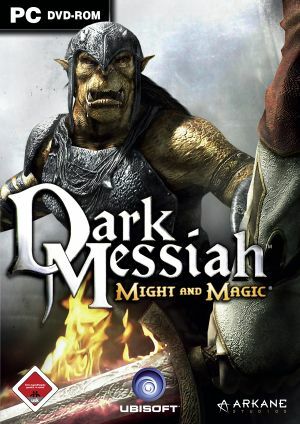 Some retail versions allow playing single player without Steam. The latest retail patch is v1.02 (you must install v1.01 first). The German version has a separate patch (this includes v1.01). Improves stability on 64 bit systems with at least 3GB RAM by allowing the application to use more than 2GB RAM. Resolves the "Out of Memory" errors. Only the Steam version is currently supported. If you use windowed/borderless windowed mode in Windows 10, the game window might stay in front of others, making alt-tabbing difficult. Enter the command mat_setvideomode width height 1. As an example, for 1280x720, type mat_setvideomode 1280 720 1. For borderless windowed mode, try mat_setvideomode width height 2. 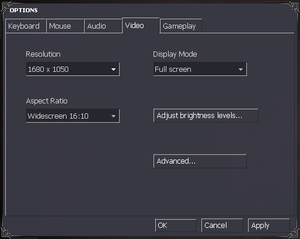 If that doesn't work, try the tools mentioned in Glossary:Borderless fullscreen windowed. To go back to fullscreen mode, use mat_setvideomode width height 0. Note: though this is a different effect from head-bobbing, head-bobbing needs to be disabled for the following fix to work. 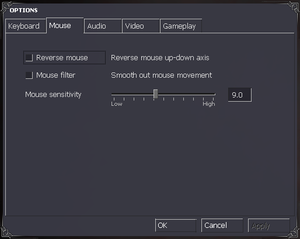 You can easily disable it by going to Settings > Gameplay. Enter the command sv_rollangle 0 to disable tilting completely. A different number can be used to change the tilting strength (default is 3). Once you're satisfied with the selected value, create autoexec.cfg in your configuration file path and put the command into it. Set autoexec.cfg to automatically execute. The value will now be automatically applied on every game start-up. Official localization by «Buka» and «Reanimedia» (Audio). A mistake in the SteamPipe update causes Xana to speak German. See Xana speaks German in a Russian version of the game for a fix. For dedicated hosting, install Dedicated Server under Tools in the Steam client. Disabling your antivirus may fix this issue. Because the SteamPipe update converted the game to a new format, certain glitches may appear - most common of which is black screen on start-up. Click on Verify Integrity of Game Files... and wait for the verification to finish. A few issues can cause this error. 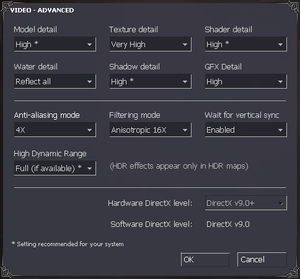 Updating your hardware drivers (including non-graphics drivers) may solve this issue. Use the command line parameter -autoconfig. If this fails, see next method. Make sure -autoconfig is not present in your command line parameters. 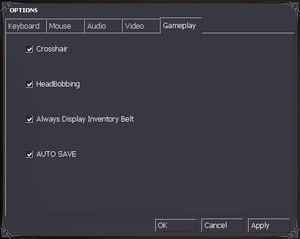 Enter the game's launch options window. See previous method, steps 1-3. Type -w [desired resolution width] -h [desired resolution height]. Download this compatibility fix and extract it. Launch PatchInstall.bat to add a fix to compatibility database. Download the proper Russian voice lines and extract them. Copy the newly extracted folders (mm and custom_russian) to <path-to-game>, overriding files if needed. 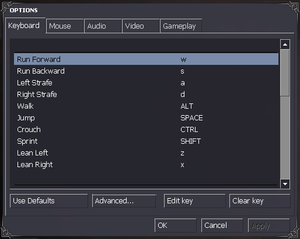 Steam and retail versions of the game install the "AZERTY (French)" keyboard layout, which can't be deleted with normal means because it doesn't show in Language options. The singleplayer version of the game does not automatically execute the autoexec.cfg file (a file that holds console commands) while the multiplayer version does. Use the command line parameter +exec autoexec.cfg. 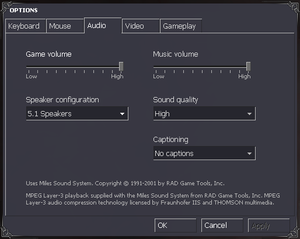 Since the game is using an obsolete version of the Source engine, the only way to set its language is by changing the language of Steam itself. ↑ 2.0 2.1 File/folder structure within this directory reflects the path(s) listed for Windows and/or Steam game data (use Wine regedit to access Windows registry paths). Games with Steam Cloud support may store data in ~/.steam/steam/userdata/<user-id>/2100/ in addition to or instead of this directory. The app ID (2100) may differ in some cases. Treat backslashes as forward slashes. See the glossary page for details. This page was last edited on 6 April 2019, at 19:26.